Way way way out of my style comfort zone. Neoprene / scuba = 100% polyester = big fat no. Crazy loud print with fake lace on it = big fat no. Bodycon style with mega shoulders = big fat no. Yet, neon neoprene lacy floral body skimming Roland Mouret galaxy dress rip off = oh yes. You just can't call it. But then it was for a party. A birthday party. A fourtieth. My fourtieth birthday party. Leaving my thirties and entering my forties in a ludicrous dress seems to mark the "importance" (in relative terms of course) of the occasion and therefore entirely appropriate. And whether they were just being kind whilst whispering "what the holy Christ is she wearing" behind my back or really did like it, I received compliments and so that was nice. I planned to make it in a beautiful plum metallic knit from Tessuti, but I couldn't get the scuba out of my head. I'm fascinated by it as a dressmaking fabric. When I think of wetsuit material which is essentially what this is, I shudder - it gives me the same feelings as fingers down a chalkboard (or for my sister, walking barefoot on carpet), but this feels surprisingly luxurious and has a lovely fluidity to it. So I scoured the internet for something appropriate (it was surprisingly hard to find) and landed on this from Emma One Sock. With all the components in place I had a crisis of confidence. How would I adapt the pattern - designed for woven fabric - to fit a stretch fabric and was I insane to make a dress out of it - wouldn't a cut off, boxy, collarless jacket be better? Once again the wonder that is Instagram came to my rescue. 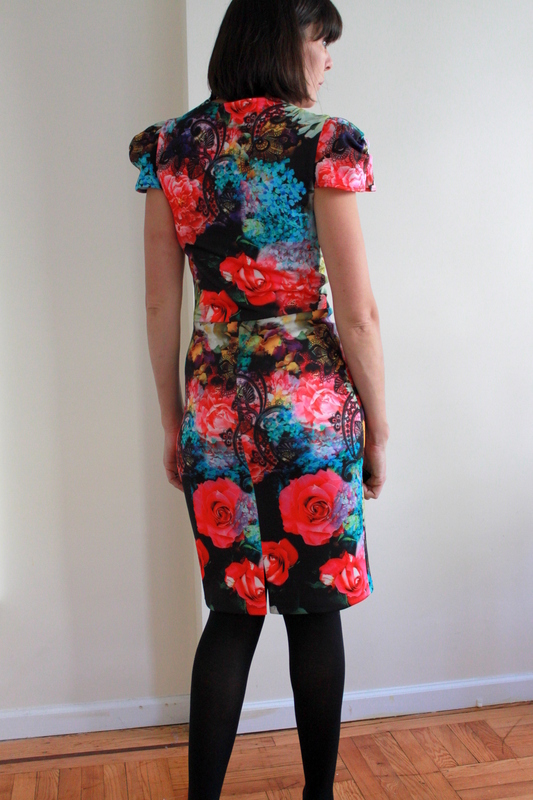 A poll declared plum = workaday, crazy neon floral = party party. And lovely Sophie came to my rescue with detailed tips on how to make V8280 work with scuba. I made a muslin, primarily so I could work out my construction process (the bodice is designed to be fully lined which provides all finishes to the neckline etc, but that wouldn't work with this fabric so I had to work out how I would finish it cleanly without), and then went to it. Such easy fabric to work with and lovely pattern details: pleats on the sleeves; the gorgeous wrapped neckline; a sleeve head and a simple back vent. It was a really quick sew - despite the best efforts of the ludicrously arranged instructions. I know nada about negative ease so I just cut the smaller of the two sizes that I was between and went with it. Removed the zip and cut the back bodice on the fold. Added 2 inches to the bodice length. Pinched out 1/2 inch at the centre of the front neckline (I should have done more as it gapes a little). All the above changes were made to the pattern itself and took three times as long as the actual dress construction. The dart removal had me flummoxed for a while but, you know, the world wide sewing encyclopaedia soon sorted that. I hemmed the neckline and flanges (yes flanges) prior to joining them and used my newly acquired double needle; which is just cool and makes me feel like a pro. I also hemmed the sleeves and used mitred corners to make them neat. I was so pleased with this. I've never done them before and they're surprisingly straightforward. After a few tortuous makes, this reminded me why I sew. It is fun. It really is. Taking a piece of paper and a flat piece of fabric and combining them to create something three dimensional that fits around the nuanced curves and corners of a body is so satisfying. For me, there is a point about a quarter of the way into any project where there is a real jolt of excitement as you see things start to take shape (but usually before any tricky bits of the construction process have been reached) and you realise this is something you'd actually like to wear. I still wasn't sure whether it was me on the night of the party (which I accidentally managed to hold in the same (renamed) venue that I held my thirtieth - which is a little sad and a little funny), but was persuaded to wear it and I felt pretty fabulous. So knowing what you like to wear and what you feel suits you is good. And important. And makes compiling a wardrobe a whole bunch easier. But, taking a little mini-step outside of that is a good thing sometimes. Especially when you're turning 40.